In Nobuhiko Obayashi's 1977 horror classic, House (a.k.a. Hausu), a band of plucky vacationing schoolgirls make the fatal mistake of spending summer vacation at a very hungry haunted house. After languishing in cult obscurity for decades, this psychedelic ghost romp got a much deserved wide release on DVD late last year, thereby delivering Obayashi's ghostly lunacy to a wider audience. Not only is Hausu one of the funniest, balls-craziest horror flicks you'll ever watch, it's a solid satire of the horror genre to boot. For those of you who've never had the pleasure of watching experiencing Hausu, here's the quick description. Imagine if Sam Raimi and Terry Gilliam teamed up to direct a 1970s condom ad. But instead of filming the commercial, Raimi and Gilliam perform their ad live in your home with shadow puppets while amyl nitrate is slowly pumped into your home's ventilation ducts. The ad has no dialogue, just the Scooby Doo theme sped up backwards on 45 RPM. At the end of the commercial, the ghost of Dario Argento materializes and vomits five pounds of Jolly Ranchers all over your lap. You suddenly realize that Dario Argento is alive in real life, and then a Good Humor truck smashes through your living room wall. And explodes. That's the short description of what House is. But for real, House's merits go beyond the acid trip death scenes you may have witnessed on YouTube. (You can skedaddle here and watch it; but be forewarned that it's one of the film's finest sequences.) Obayashi previously worked as a commercial director, and much of House has the ambiance of a canned coffee ad. And in many ways, House is the ultimate commodification of the grindhouse horror movie. The film's pastel countryside and cigarette ad sunsets gives way to the least shadowy haunted house in cinema history. Every time its evil spirits make themselves known, the whole damn set lights up like a pachinko parlor. Even its soundtrack sounds like a television jingle — the same poppy leitmotifs recycle constantly and score a bunch of innocent teenagers skipping to their collective doom. Each of the character's stock personalities compound this self-aware artificiality. Each of the Japanese schoolgirls has an easily digestible (cue rimshot) personality: there's Gorgeous (the pretty one), Fantasy (the heroic lead), Melody (the musical one), Kung-Fu (the tomboy), Sweet (the nice one), Prof (the smart one), and Mac (who's basically a female Chunk from Goonies). Despite portraying teenagers, the girls frequently appear naked or in states of undress — maybe half a dozen times, the film feels like it will break into softcore theatrics. For example, Kung Fu's pants fly off for no reason midway through, leaving her tromping around in bike shorts (she never rectifies her lack of pants). Even the film's credits have an easy, sleazy eroticism about them. After 90 minutes of watching girls getting comically eviscerated, the audience is treated to a bucolic commercial reel sans product placement. Men are noticeably nonexistent in Hausu. The only major male lead is Mr. Togo, the girls' bumbling instructor whose incompetence is a subplot unto itself. Without spoiling too much about the house's secrets, we learn that the house's vendetta against the girls is fueled by a broken heart. For many of the doomed girls, it's the shortest coming-of-age story ever, a Nancy Drew mystery that ends at the bottom of a well. So if Hausu knows it's not scary, where does the horror come in? In its paint-by-numbers treatment of the horror movie formula. In one telling scene, the girls' gleeful description of a World War II-era wedding dress ("Like cotton candy!") syncs up with footage of the atomic bomb going off. This isn't a throwaway line — Obayashi grew up in Hiroshima and had friends die in the bombing. Hausu as a whole mirrors this exchange — the aesthetics of advertising are applied to horror cinema. The movie has all of the contrivances of your standard horror flick, but the gore and terror are glossed over with Shibuya-bright visuals, giggling models, and headache-inducing animation. It aspires to hypnotize rather than terrify, making it a giddy watch 34 years later. * It is Evil Dead by way of Mr. Sparkle, an experience that will be tattooed on to your mind's eye until your brain is devoured by spectral real estate. 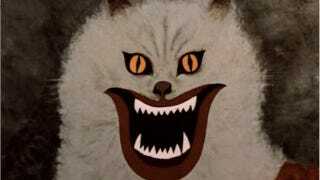 *Also, Hausu is jam-packed with images of evil cats. The internet loves evil cats.